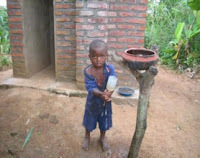 In February of 2010, 3for5 made a $10,000 grant to Water for People to help fund water projects in Malawi. We recently received a midterm progress report from Water for People, and are excited to share it with you! Read on for some very encouraging details (note: the text below has been excerpted directly from WFP's report and is accurate as of September, 2010). Objective: To increase access to water and sanitation facilities and create incentives for positive hygiene behavior change in the Chikhwawa District of Malawi. Water For People is pleased to report on the progress of the Chikhwawa Water, Sanitation, Health and Hygiene Promotion Program. In partnership with the Chikhwawa District Assembly, local non-governmental organization (NGO) Freshwater Project, and local communities, Water For People-Malawi is working to complete water, sanitation, and health and hygiene programs in approximately five schools and 12 communities located in three Traditional Authorities (TA's) of Kasisi and Maseya. Upon completion of the program approximately 3,250 community members will have access to clean water and hygiene education and 2,749 school children and teachers will have access to clean water, sanitation, and hygiene education. Community sanitation programming is ongoing and the number of latrines built will be based on the success of local sanitation business programming. Water: Funding from 3for5 Foundation is supporting the rehabilitation of broken wells and the implementation of new wells in the District of Chikhwawa. 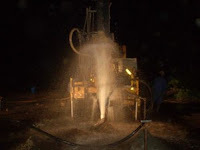 Water For People is pleased to report that the rehabilitation of the 5 shallow wells is complete and construction of the 7 new borehole wells is on track to be complete by the end of December 2010. Each of these wells is fitted with an Afridev hand pump. Village level water committees have been formed in all twenty of the borehole project sites and are receiving training on operation and maintenance of the Afridev hand pump. Additional training on committee procedures, roles and responsibilities of committee members and financial management of the system will take place during the implementation of the well. Committee members are working at mobilizing and educating the community on the importance of paying water tariffs to ensure the committee can pay for spare parts and maintenance of the system in the future. In addition to community need, Water For People is also facilitating the installation of wells in five primary schools. Sanitation: Funding from 3for5 Foundation is supporting the development of a sustainable community sanitation services program using a business approach. The grant is also supporting a comprehensive school sanitation program. Water for People-Malawi's Sanitation as a Business program shifts away from the traditional subsidy-driven sanitation programming and instead focuses on a business-driven model. The program trains local masons to be Sanitation Entrepreneurs and teaches them how to build ecological sanitation latrines for individual households. The latrines are designed to compost human waste into valuable fertilizer. The entrepreneur returns regularly to purchase and remove the compost and through this exchange, the family pays off the cost of the toilet. The entrepreneur can then sell the compost to local farmers and is incentivized to get other households to want a composting toilet to increase profits. In order to support the Sanitation as a Business program, Water For People-Malawi and local partners have trained fourteen local masons as Sanitation Entrepreneurs. In addition, Water for People-Malawi and local partners are working to educate community members on the use and benefits of latrines. The entrepreneurs are currently building improved pit-latrines or composting latrines in communities throughout the TAs of Kasisi and Maseya. By December 2010, Water For People-Malawi speculates that a minimum of 25 households in each targeted village will have household latrines and those who opt for a composting latrine will pay the entrepreneur back in compost. Households with children under five will also receive child size sanitation platforms to place over a small hole in their household yard. These appropriate sized latrines are less intimidating for small children and will teach children at a young age the important habit of using latrines, as opposed to open defecation. Sanitation facilities will also be implemented in the five targeted communities. Ecological toilets will be built at each school. The number of latrines built is proportional to the student population. The latrines have a superstructure and cement floors that provide privacy for the children and also make the latrines easy to maintain and keep clean. Hygiene: Funding from 3for5 Foundation has been used to develop and implement community and school hygiene education programs. Water For People-Malawi’s partners are carrying out hygiene promotion programs for the twelve targeted communities. Using drama, music, leaflets, posters, flip charts and demonstrations, the hygiene program focuses on changing the following key hygiene behaviors: four important times for handwashing (before cooking, before eating, after using the bathroom, and after cleaning a baby), proper water storage techniques and the elimination of open defecation. Similar messages and means for promoting health and hygiene education in schools are also taking place. Each school is forming a hygiene club that helps to disseminate and organize hygiene activities in the school. In addition, these clubs, made up of students and teachers, are also being trained on operation and maintenance of the latrines and handwashing stations. Alternative Operation and Maintenance: Funding from 3for5 Foundation has helped to develop sustainable private sector approaches that have the potential to provide better service, less downtime and greater efficiency. In 2010, Water for People developed a circuit rider program that trains local mechanics to provide regular maintenance and timely repair of water systems, while giving local communities alternatives for system maintenance. Approximately five mobile mechanics are being trained and can be contracted by the village water committees to provide advanced technical support to each community. In addition to the circuit riders, communities and school officials are being trained on operation and maintenance of their systems. They are also receiving additional financial training to be able to support future repairs and eventual replacement of their systems. Capacity Building: Funding from 3for5 Foundation has been used to help build the capacity of our partners to be able to support each project for the long term. Water For People-Malawi has held a series of capacity trainings in the form of exchange visits, workshops, mentoring and on-site coaching. These trainings have focused on strategic planning, advocacy, organizational management, and project development and management. Water For People is planning two Joint Program Planning and Review Conferences to share challenges, opportunities and lessons learned amongst our partners and other development organizations. In Chikhwawa, four meetings were held with implementing partners to discuss and map out project components and methods for monitoring and evaluating the outputs, outcomes, and impact of each water project. In 2010, training was conducted with the District Assembly, specifically the District Water Officer, in water-point monitoring. Replication and Influence: Funding from 3for5 Foundation has also helped Water For People-Malawi to influence policy and sustainable programming in other parts of Chikhwawa and Malawi. Water For People-Malawi participated in the production of the Chikhwawa District WASH Strategic Investment Plan (DSIP). This plan will support the institutionalization of the National Water Point Mapping database as a planning tool for Chikhwawa District Assembly. The database will help the district assembly to more accurately track community needs and responses to these needs. Water For People-Malawi also worked to develop a Citizen’s Action Initiative to enhance transparency, accountability in resource allocation, and delivery of water supply and sanitation service in the district. In 2010, the Chikhwawa WASH District Strategic Investment Plans were disseminated; the plans are being shared with different stakeholders and potential donors that want to work in the Chikhwawa District. Water For People-Malawi is also gaining attention from other international and local NGOs, as well as the Ministry of Irrigation and Water Development and the University of Malawi for our innovative Sanitation as a Business model. In addition, the district government asked Water for People to lead in discussions in a number of forums like the preparations of the African Health Congress meeting, which took place in Malawi in May. We were also asked to review Government documents like the Operation and Maintenance Manual for rural water supply, and help in the development of Terms of Reference for Sanitation for the peri-urban areas.